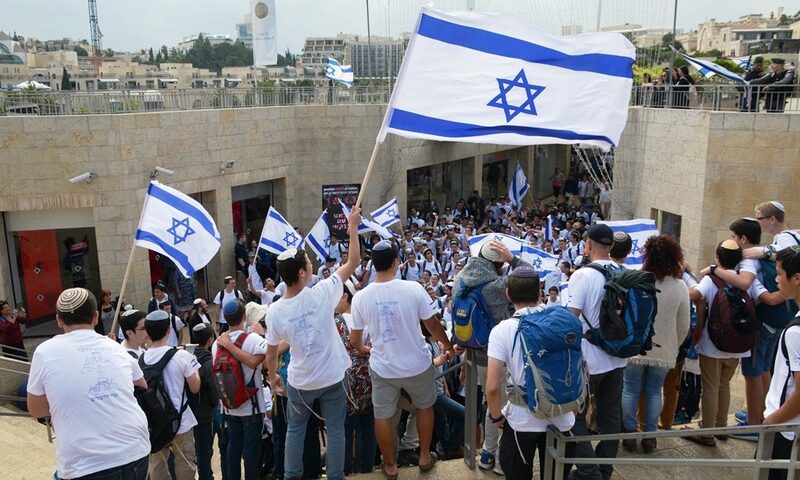 Yom Yerushalayim, Jerusalem Day, in Yerushalayim, is usually a special day. 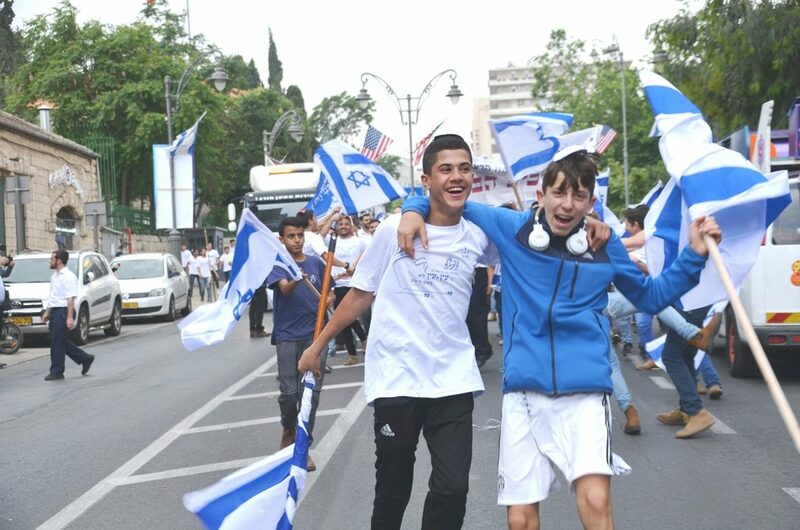 However, this year Jerusalem Day was even more special, for many reasons. Netta mania goes on. 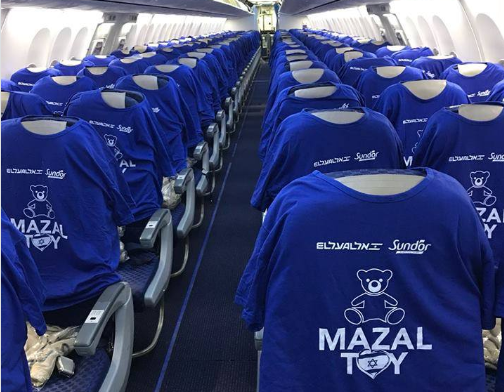 This photo was posted of an El Al plane for her trip back to Israel from Eurovision, winning with her song “Not Your Toy.” Notice how mazal tov, became MAZAL TOY. It was one thing for thousands to turn out in Tel Aviv to welcome her back, but I saw a video taken in Lisbon, where thousands were singing along with Netta Barzalai during the song competition, was something else. 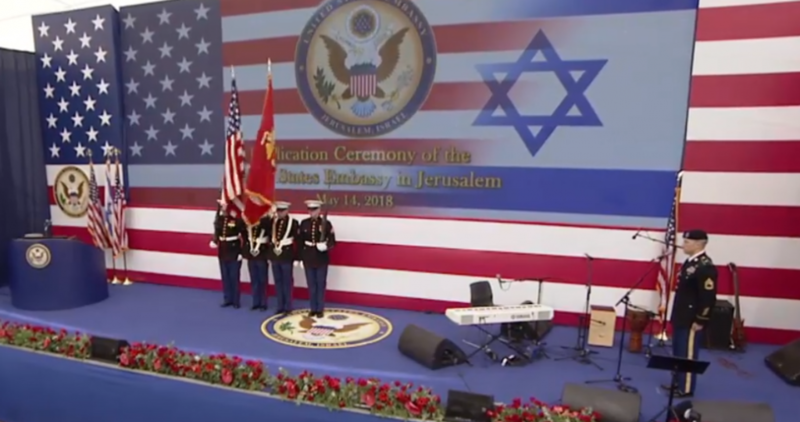 And then there was the opening of the US Embassy in Jerusalem, Israel. It opened with the presentation of colors by a military honor guard and a room full of US dignitaries. 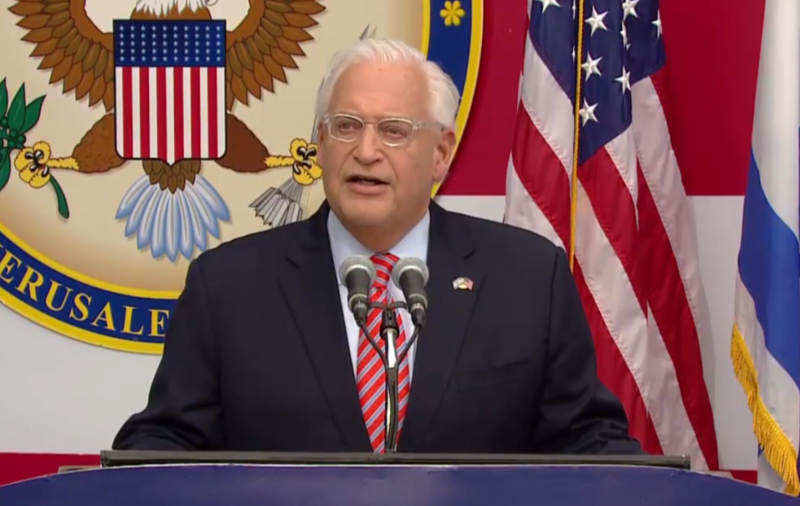 US Ambassador David Friedman said, “Jerusalem, Israel” and led a live-streamed ceremony with international media coverage. We will have to wait to see if babies born to US citizens in Jerusalem, Israel, will have that written on their US passports. “Jerusalem, Jerusalem” is what was written until now. The celebrations, feasts and events with officials for the US Embassy opening are still going on. 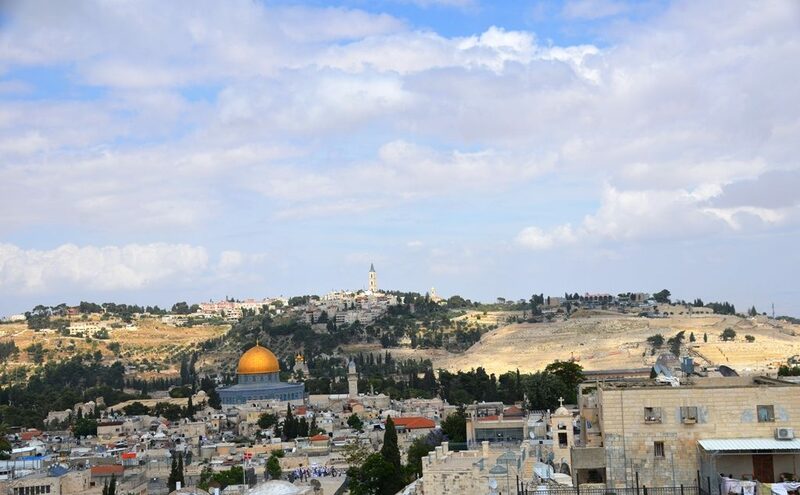 Here is one view of the Mount of Olives on Yom Yerushalayim from the top of the Tower of David. 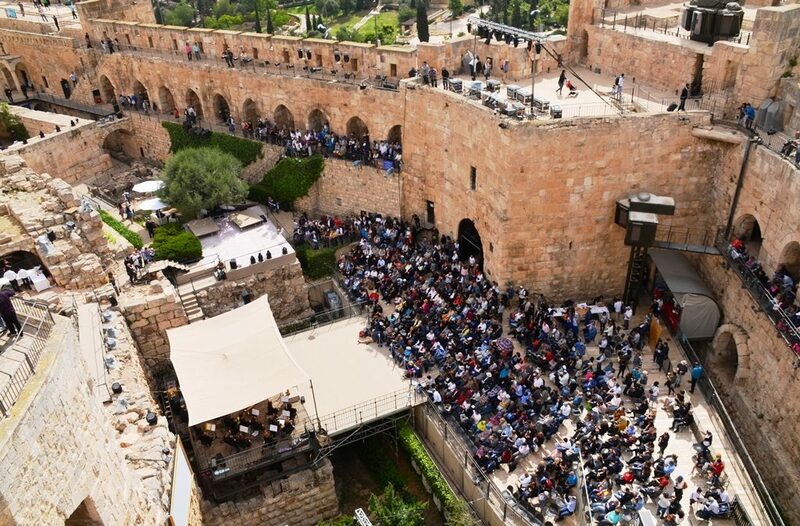 The Tower of David, open free of charge on Yom Yerushalayim, is a popular destination for celebrating the holiday. 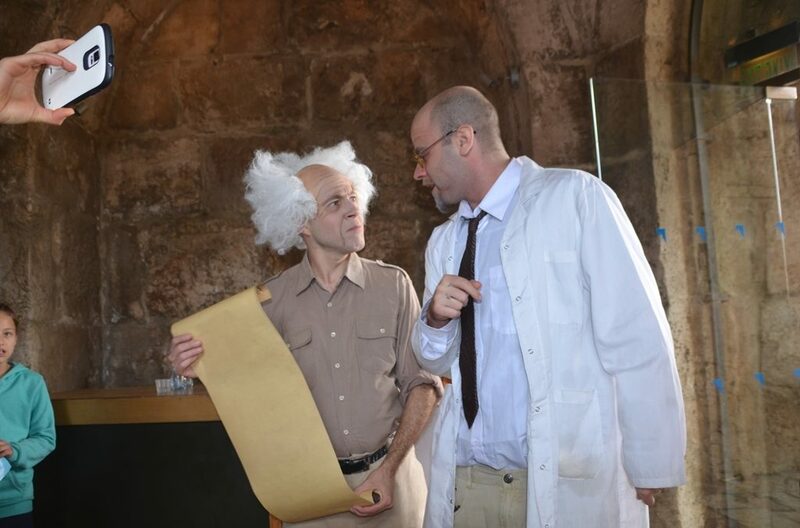 Actors dressed as historical figures, included Golda Meir. Ben Gurion and Chaim Weizmann were near the entrance, a day for the young and not so young. Hundreds came to hear live music and be greeted by the Mayor of Jerusalem. Oh and thank you Berman Bakery, for the fresh and free sweets all day. The Hurva Synagogue was draped with an Israeli flag. After the morning rain, you could see the Dead Sea and Jordan in distance. This woman took the prize for best theme outfit of the day. The enthusiasm, singing, and dancing of the Flag Parade filled Agron Street. 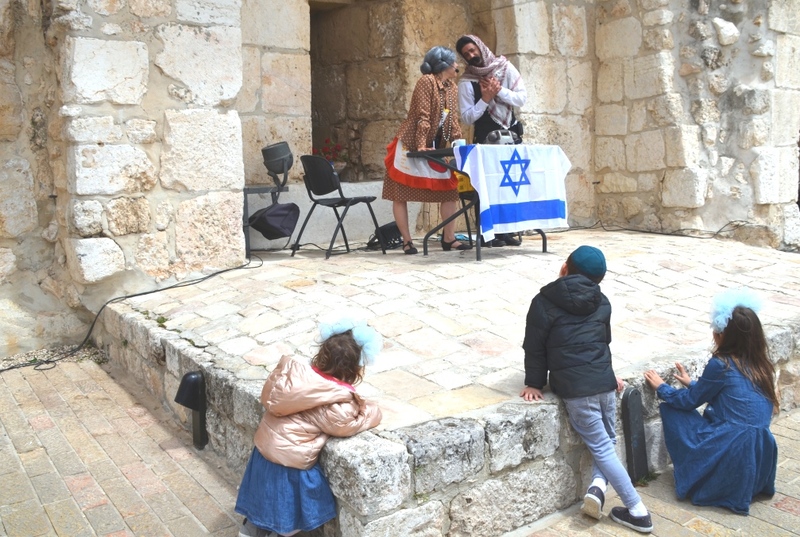 This group stopped to sing and blow the shofar as they proceeded to the Kotel, Western Wall. Watchman star, Erick Stakelbeck. 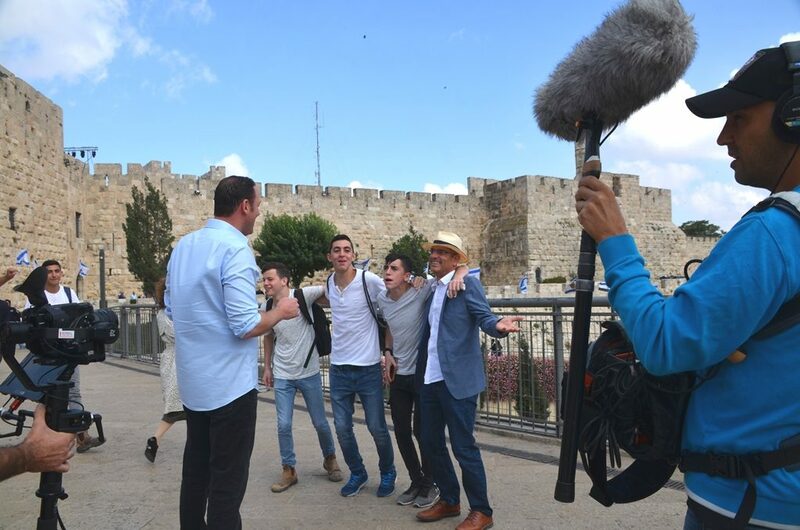 was filming near Jaffa Gate, with the Tower of David in the background. The crew was ready and the camera started rolling. When a group of young Israelis danced on to the set and scene. I asked if that was planned and part of the show. It was not. But instead of being overly upset, Stakelbeck joined, smiled and danced around for a few minutes. Some streets were blocked for the Flag Parade. This year the gathering points and route were somewhat different. Yes, it is loud, sometimes very loud. But it is not violent, and not only young males with too much testosterone participating. Families came to walk and watch. All ages are out on the streets. 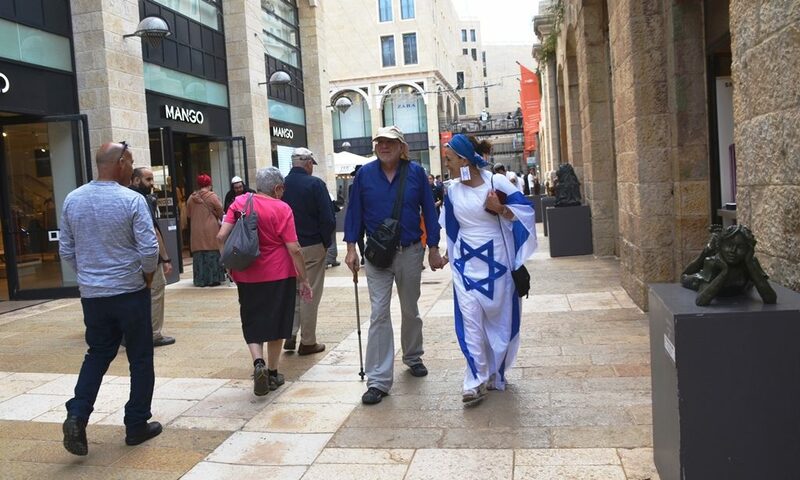 Young Israeli women were on a different and alternate street. I did not do the whole walk as in past years. With an earlier start time, and threatening weather, the marchers were spread out and the Old City route was not as congested as in past. Buses from around the country were arriving all afternoon. Tens of thousands ended the march at the Kotel, Western Wall, at the end of the day as the sun set. Singing and dancing filled the plaza and overflowed. 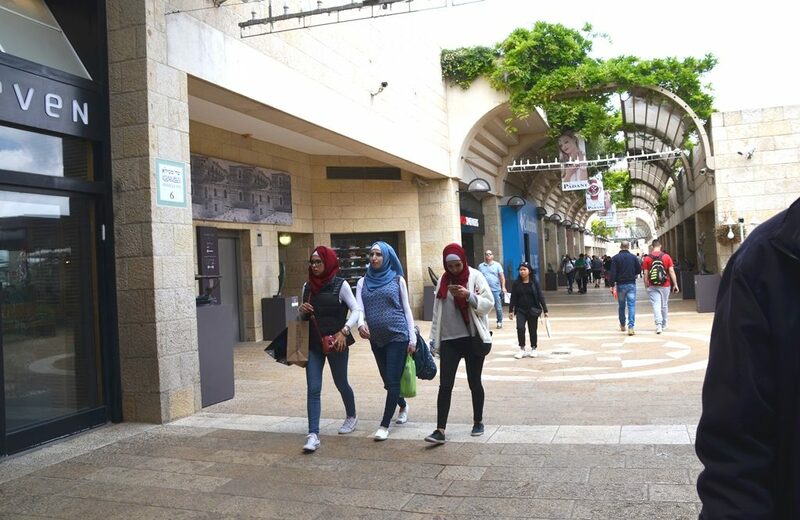 With all of that, Arab girls were out shopping in Mamilla Mall. 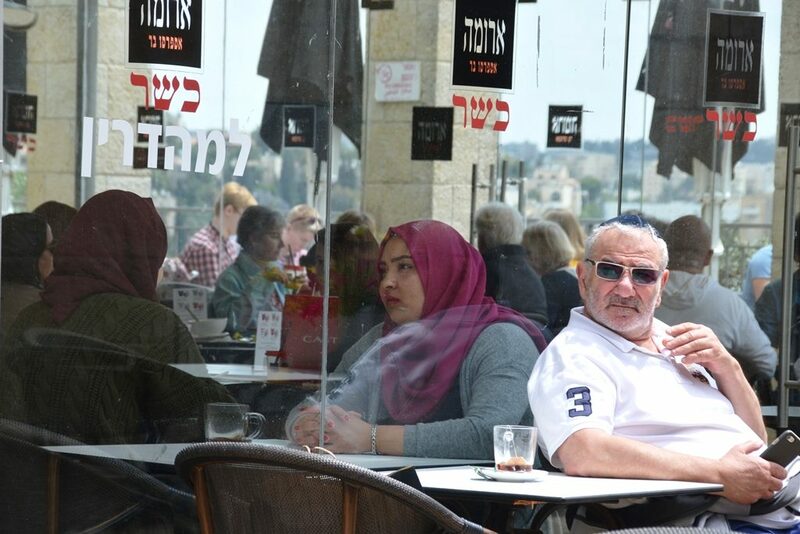 Two Arab women were sitting in the Mamilla Aroma Cafe. The violent protests along the southern border from Gaza were distressing and for Nakba Day, there are reports of new violence. Life may not be a bowl of cherries. 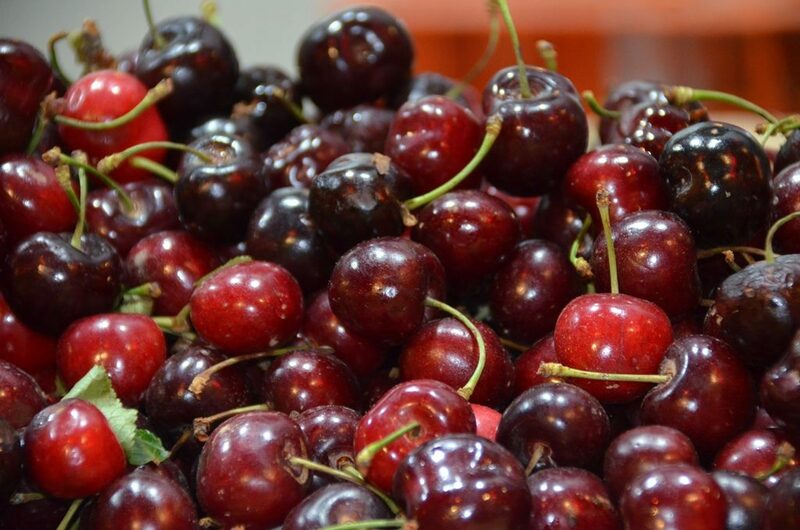 But fresh cherries are piled high in the shuk, Machane Yehuda Market. 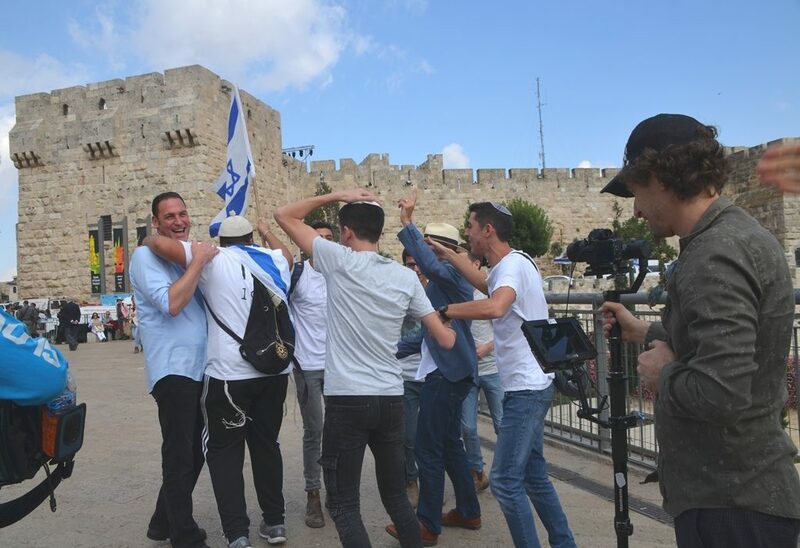 In areas under Jordanian occupation from 1948-1967, where Jews did not go, on Yom Yerushalayim there was celebrating and dancing on those streets. There were so many other local and official celebrations, I cannot begin to list them all. The day ended with prizes, more music and fireworks at the Tower of David at night. 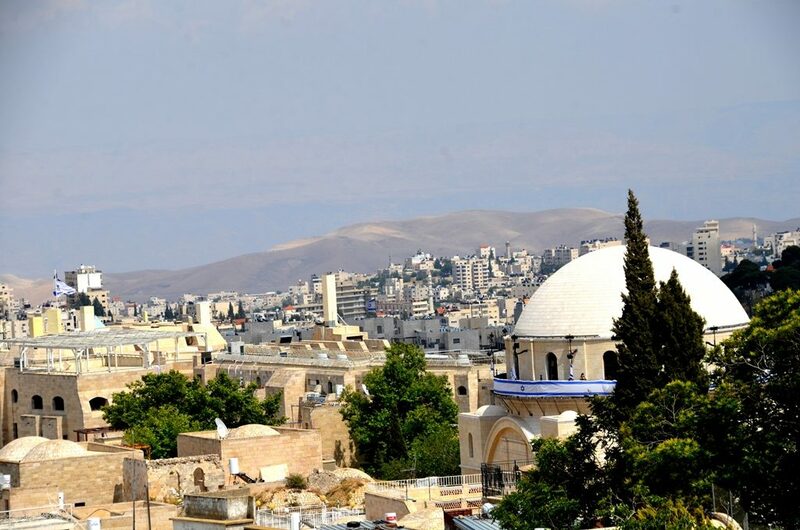 The Embassy of Guatemala is opening and the month of Ramadan is starting. 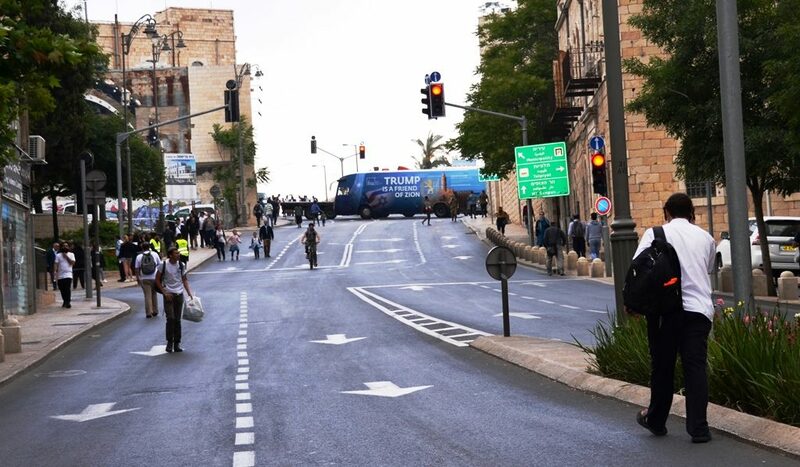 So much happening on Jerusalem streets.